Oh, hey, this is cool. Researchers at the University of Manchester have made their own map of the city's tram network. It doesn't address any of our concerns about the readability of the network (boo). But it does do something else. Click to expand. Slightly. Ful size version here. The purple blobs are female life expectancy at selected stops; the light blue ones are (lower) male life expectancy. In between there's a tiny dark blue number, showing how deprived the area is: basically, high numbers are rich, low numbers are poor. The journey from Timperley to Rochdale (one of the most economically deprived areas of Greater Manchester, where life expectancy is 69.4 years) can take around 75 minutes for a journey of 26 kilometres, but the difference in life expectancy between the areas is more than a decade – around a year for every 7 minutes. The life expectancy gap between men and women is striking at the local level. For example, in Timperley life expectancy for men is estimated to be 78.3 years compared to 81.3 years for women – a difference of 3 years. However in Rochdale life expectancy for men is estimated to be 65.7 years compared to 74.3 years for women – a difference of 8.6 years. The similarities are not a coincidence. The two projects both have variants of the name "Lives on the line", and Purdam's blog links back to the London version, suggesting it was an inspiration. What both projects show, I think, is metro maps can be a really useful device for helping to communicate aspects of a city that have nothing to do with transport. The geography it represents may be distorted, but it's also more recognisable through familiarity. 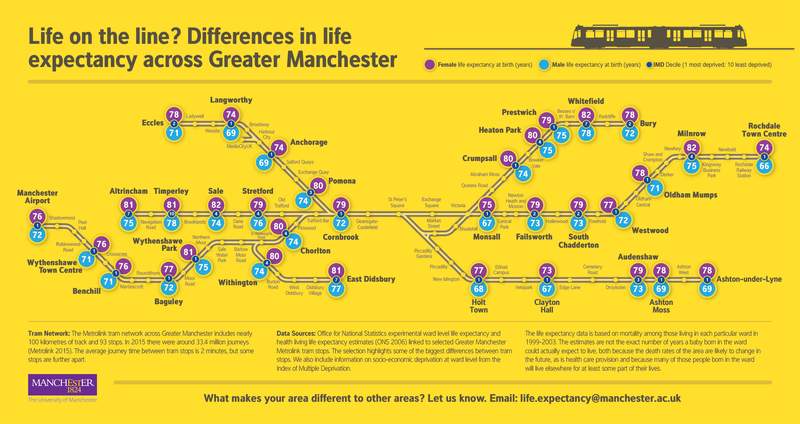 That makes the difference in life expectancy between Rochdale and Timperley hit home. Just one more way in which cities without decent transport are losing out.